1) First Visit: Please plan to arrive at least 15 min early to fill out the required forms and waivers. You may also download the forms ﻿﻿here﻿﻿ and fill them out at home prior to your visit. Further Visits: Please arrive 5-10 min before class to give yourself a chance to get settled. The front inside door of the studio will be locked during class, unless additional staff is present. You will not be allowed to enter the class once it has started. 2) Shoes are not allowed in the room where yoga is practiced. If you have a special health condition that requires you to wear soft-sole indoor shoes, please discuss with the class instructor. You may also wear socks during your practice if that is your preference. 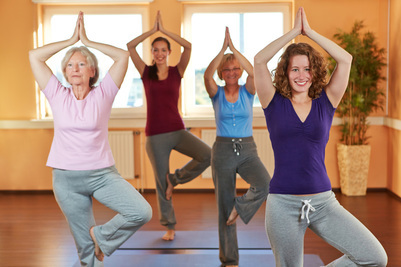 4) Please wear yoga attire that is comfortable, stretchy, and appropriate for group practice. Avoid wearing revealing attire. 5) Please turn off your cell phone during class to avoid disturbances. 6) Please refrain from wearing perfumes and strong fragrances as many class participants have sensitivities to smells. 7) Please leave valuable items in your car, the studio will not be responsible for loss or theft of personal belongings. 8) It is our aim to create a peaceful and safe space for everyone to practice in, free of stresses and confrontations. If you have any concerns about any of the classes or about the studio, please discuss these matters privately with the studio owner or the class instructor by booking a personal meeting. 9) No form of harassment will be tolerated at the studio. 10) Please note that we have one bathroom on the main floor and two on the 2nd floor which may be used as change rooms. We have a closet and shelving for shoes and boots. Use of the studio mats, blocks, straps and blankets is free of charge. Please make sure that you leave the washrooms tidy, and that you use the studio props with proper care and respect.